TV One, on the heels of a record-breaking 2012 fall launch, has announced a second season pick-up of its original hit sitcom The Rickey Smiley Show. The second season of The Rickey Smiley Show is scheduled to begin production in April with a 26-episode order and is slated to premiere in the summer of 2013. The September 2012 premiere of The Rickey Smiley Show, which catapulted TV One to a network ratings high, garnered a 1.08 HH rating, delivering 621,000 homes and among P25-54, earned a 0.75 rating, delivering 468,000 viewers. The second original episode airing at 9:30pm improved on the premiere, garnering a 1.12 HH rating, delivering 642,000 homes and among 25-54, earned a 0.83 rating with a delivery of 515,000 viewers. Over the four telecasts of the premieres and encores, The Rickey Smiley Show had a gross average audience of nearly 2.3 million viewers. The Rickey Smiley Show stars comedian and nationally syndicated radio personality Rickey Smiley. In the series loosely based on his life, Smiley plays a popular national radio personality who is a single father trying to balance his family life - including his ex-wife - and career in the spotlight. The half-hour multi-camera comedy also stars multi-platinum artist and actor Ray J as Kenny, Smiley's morning show producer and protégé; J Anthony Brown as Rickey's radio station manager Maurice, aka "Mo-Sweets" from his earlier rap career; veteran actress Roz Ryan as Aunt Sylvia; Jay Lewis as Rickey's 18-year-old son Brandon; Ajiona Alexus as Smiley's 16-year-old daughter De'Anna; Gabriel Burgess as his youngest son Aaron; Noree Victoria as his business manager Simone Renee Jackson; and Demetria McKinney as Rickey's uber-career oriented ex-wife, Monica. The series also features several celebrity guest stars and special appearances from many of the original characters Smiley has made famous on his radio show over the years, including Mrs. Bernice Jenkins, Lil' Daryl, Minister Joe Willie and Beauford. The Rickey Smiley Show is produced for TV One by BobbCat Films. Executive producers include veteran television and film producer Roger Bobb (Tyler Perry's House of Payne & Meet the Browns), series star Rickey Smiley, Yolanda Starks-White, and Ward White. Executive in charge of production for TV One is Tia Smith. Stay with us in the coming days as we announce a classic comedy coming to the TV One Friday Night Classic Comedy line-up this spring, joining recent addition What's Happening! !, and other series like The Jeffersons. And stay with us for continued updates ob The Rickey Smiley Show and all things TV One! Fox's Tuesday adorkable sitcom starring Zooey Deschanel airs Tuesday nights at 9:00pm and we have just watched the next episode that airs tonight (March 19). We have Odette Annable (Fox's Breaking In, House) guest starring! In the episode airing tonight, "Quick Hardening Caulk," Jess (Zooey Deschanel) comes to a conclusion about her romantic feelings for Nick (Jake Johnson) and she struggles to tell him - until she's hopped up on pain medication. But after admitting her feelings, she finds out he may have been keeping something from her. Meanwhile, Schmidt (Max Greenfield) becomes obsessed with buying a fish, which Winston (Lamorne Morris) sees as a metaphor for Schmidt's unresolved feelings toward Cece (Hannah Simone). 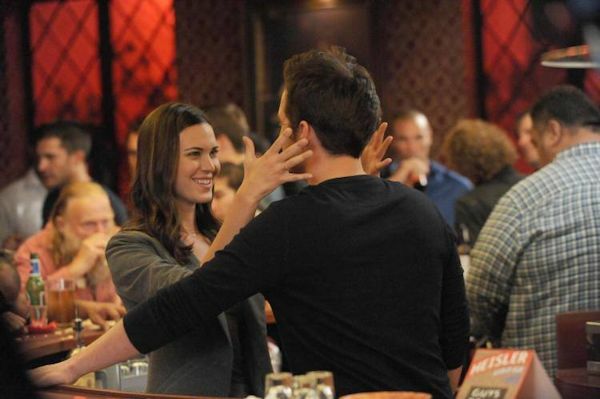 And, Nick plans a bar promotion to impress the bar owner (guest star Odette Annable). The episode opens with Schmidt and the gang drinking at the bar. They are surprised when Nick gives them a check. Nick comes up with a promotion of a guys' night out. Nick's ambition at the bar makes Jess want him even more. Later, Schmidt and Winston see the new bar manager, Shane, kissing Nick at the bar. 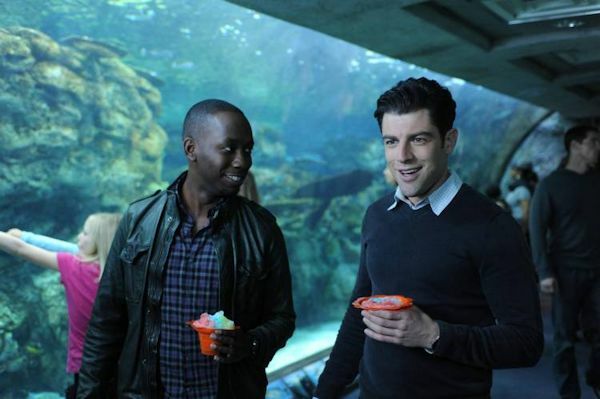 Schmidt and Winston then go the aquarium where Schmidt spots a beautiful and exotic fish. The gang is surprised when Schmidt brings an aquarium into the apartment. Jess takes Nick to the hardware store to pick up some supplies, including some quick hardening caulk, for the promotion at the bar. Jess is accidentally knocked out by a piece of wood. While she is hopped up on pain medication, she does a Judy Garland impersonation and shows him her true feelings. Schmidt and Winston take their search for the elusive lion fish to the ocean, but trouble strikes for Schmidt. Jess surprises Nick at the bar where she sees a secret has been kept from her. Cece later visits Schmidt and brings him a gift. Finally, Jess and Nick get in a huge argument at the apartment over what she witnessed at the bar.